This line from the recent feature article in Central Oregon New Home Living Magazine on me and my mobiles cracks me up... because it's SO true. You see, spatial relationships and balance have always taunted me. - I wasn't admitted into the gifted program as a child because I couldn't figure out how to put some silly plastic blocks together into a prescribed pattern. - I love mountain biking, but am more likely to be found running into trees, off a cliff or into unsuspecting wildlife than staying on the trail. I wish I could blame it on a genetic defect or a bad batch of spinach when I was growing up, but - alas - it is what it is. So, if you find me running into walls or tripping over imaginary bumps, feel free to chuckle a little... because it's okay to laugh, really. That said and even though my balance problem was outed in print, I really *was* honored to have my mobiles spotlighted in the magazine (a special publication of The Bend Bulletin and Western Communications, Inc.) and the writer, Lori Gleichman (who is talented as all get-out), was a real pleasure to share time with. 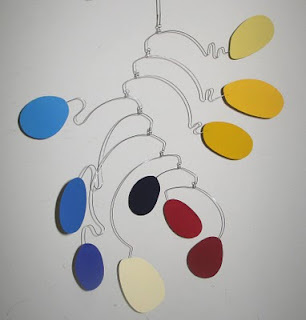 In fact, she ended up commissioning me to create an uber-colorful mobile for her husband's birthday (see below).